DataByte Visitors™ is a fully featured visitor management software package that enables you to register and manage visitors from your front desks or reception areas. This software module forms part of DataByte WORKFORCE™, a cloud based software suite for Human Resources teams with integrated Payroll, Leave Management and Time and Attendance Software. Learn more about our HR productivity software. What are the benefits to using DataByte Visitors™? With DataByte Visitors™, you can rest assured that you and your security staff and receptionists do not need to rely on loose pieces of paper with your visitors listed on it. All visitor logs are stored within your online database and can be printed quickly in cases of emergency. This software allows you to schedule visitors well in advance, and allows for the creating and printing of visitor tags which can be customised with your company logo in order to provide validation for security clearance. You may also associate a vehicle registration number with a visit, meaning that your security staff or receptionists will know when your visitor arrives before they approach your front desk or reception area, as well as identify and resolve obstructing parking. DataByte Visitors also complies with Health and Safety regulations and instantly reports visitors in the house during emergency situations. Security companies and receptions who service multiple companies in one office building are catered for, as within DataByte Visitors™ you can set up an unlimited amount of different companies within one instance of the cloud-based software. Pricing for DataByte Visitors™ is based on the amount of companies it is used for. Licences can be purchased per company, meaning that you don’t need to pay for more than you need. DataByte Visitors™ runs on our secure and robust Fusion Framework which is hosted on Microsoft Azure. This setup does not require any client side installation and allows you to login from any device with an internet connection. It also reduces IT costs as you don’t have to worry about moving around databases when changing computers. Learn more about our robust, cloud based system. 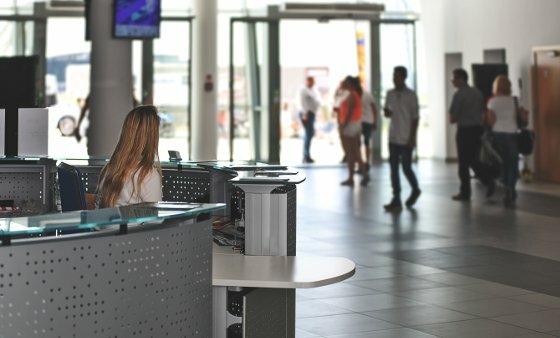 With the option to connect an MRZ reader, DataByte Visitors™ can recognise official documents such as visitor ID cards and passports which allows buildings with a high visitor flow to be able to process visitor inflows very quickly and efficiently as visitor data is extracted from these documents. When signing in, your visitors will never see any mention of other visitors within the building, unlike what happens with traditional visitor signup sheets. This system provides reporting and statistics on your visits, which allows you to place your staff strategically in order to be able to serve your customers quicker and make the staff members that are in higher demand, more accessible. Who should buy DataByte Visitors™? Government departments, educational institutes, corporate buildings, offices and outlets with high volumes of visitors and meeting rooms, banks and other entities which require strong security and compliance where their visitors are concerned.